Cricket, like life, is a great leveler. Whenever you take it for granted and look ahead of yourself without respecting the present, more-often-than-not, it comes back to bite you hard. It is exactly what happened with Team India a couple of weeks ago. The visiting Australians- a side that had won just three games in the entirety of 2018, came back to reverse a 0-2 scoreline into a 3-2 win. This victory said a lot of things. It not only reminded us of Australia’s insatiable spirit of never giving up but also testified the need to respect the present and not get consumed by the future. Australia was playing the series at hand while India’s sole objective of the series was to audition fringe players and find the best possible playing 11 for the World Cup. Seeing, how both sides’ have shaped up in the past 24 months, you cannot entirely blame Kohli and India to take the series- the last five ODIs before the World Cup, as a potential dress-rehearsal for the main event, but the fact remains, let alone the series win, the sole-objective- to find the ideal playing 11 for the World Cup, also ended up in a quandary. Wondering why India landed up in such a quandary after being so dominant in the past few years? Experimentation is the key word here. For cricket fans who have followed Indian cricket in the Greg Chappell era, they would distinctly remember this 15-letter word. It is a word that didn’t go well with Indian cricket then, and if early signs serve as a cue, it‘s not shaping up well this time either. Chappell and the team management back then had a penchant towards to what he called ‘out-of-the-box’ changes which included slotting Irfan Pathan up the batting order or asking Laxman to open the batting in Test cricket and not to forget pushing Tendulkar to the No. 4 spot in One-day cricket; a move he clearly wasn’t comfortable with. In a team sport, apart from all the talent and personnel, one of the most crucial things is the role-identification for every player. One of the prime reasons why India have gone nowhere with their search of a game-changing middle-order batsman, apart from the fact that none of the 11 candidates nailed down the opportunities that were handed to them, is the fact that the team-management haven’t been able to strike a balance between giving opportunities and seeking alternative options. Excess of either is fatal. Frequent chopping and changing in the playing 11 or the batting unit can have an impact on the mindset of the players. Not knowing what his role is, can be chastening for any cricketer. It plays on his mindset to the extent that it diminishes his ability to execute his skill-set, which is what happened with the Indian team of the Chappell era. The implication: India lost to Bangladesh and Sri Lanka to get knocked out of the 2007 World Cup. The 2007 disaster meant the word ‘Experimentation’ was shunned in the cold storage of Indian cricket, never to be uttered with it in the same breath again. Not really. The word reared its head yet again when the Men in Blue started auditioning for the No. 4 spot after the 2015 World Cup and peaked during the series loss against Australia as India ran around in circles with unending hit-and-trial to get the perfect combination. Experimentation remains a misconstrued concept. It is not about chopping and changing at will; far from it, actually. It means identifying a potential candidate for a specific role and persisting with him for a period of time without leaving a sword hanging above his head. One of the major reasons why India have gone nowhere with their search of a potent middle-order batsman, apart from the fact that none of the 11 candidates nailed down the opportunities that were handed to them, is the fact that the team-management haven’t been able to strike a balance between giving opportunities and trying newer options. Excess of either is fatal. While the candidates can be deemed guilty of not nailing down their spot in the limited opportunities that they got, but the fact that the persistence and support from the team-management have been at a premium; not to mention incongruous selections, have not helped either. Dinesh Karthik, who India invested in for over a year was dumped for the series against Australia in favor of Rishabh Pant, which begs the question why the left-hander wasn’t given enough game time against New Zealand and Australia or even in the ODI series at home where Pant got just a couple of games to seal his ticket to the World Cup. Like Karthik, Ajinkya Rahane and Shreyas Iyer also felt the brunt of inconsistent selections last year when they were dropped after the South Africa series  in favor of Suresh Raina who was picked on the basis of his T20 form. Following a lackluster series against England , Raina too fell off the radar immediately with Ambati Rayudu coming into the fray; again on the back of his T20 numbers. On other occasions, like in the fourth ODI [vs Australia] and England series , Virat Kohli slotted himself at No.4 to accommodate Rahul at No.3. When Ambati Rayudu emerged as the leading run-scorer against New Zealand in February, it looked like the audition was finally over and that the Andhra batsman had vindicated Virat Kohli‘s words after the Windies series that the former is the best suitable for the No. 4 spot. 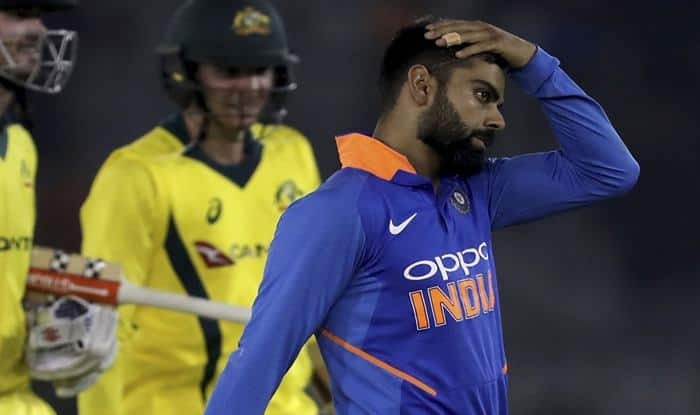 But twin failures against Australia where he looked all at sea against the wrist-spin of Zampa and the pace of Pat Cummins, put him off the radar completely, so-much-so that he was dropped from the playing 11 with Virat Kohli and even Rishabh Pant slotting in at No.4. This move once again testified the team-management lack of persistence in what they had backed for almost a year, and with Rishabh Pant not making the most of his opportunities in the last ODI, the pandora box is still wide open and India still does not know who their No.4 batsman will be at the World Cup, and you know the situation is dire when the likes of Cheteshwar Pujara, who has not been in the scheme of things as far as white-ball cricket is concerned, are alluded by experts for the possible solution to the No.4 spot. Finding an ideal No.4 batter also affected the team combination during the ODI series, which was already skewed by injury to Hardik Pandya. The ODI series against Australia also proved how Hardik Pandya is a central piece of India’s jigsaw puzzle. He is a kingmaker as his presence in the team allows Kohli to play both his wrist-spinners with Jadhav or Shankar or both playing the role of the sixth bowler. Shankar has demonstrated his ability with the bat in the past two series. According to Cricviz, during his 41-ball 46 at Nagpur , Shankar played just 4.1 % false shots- an innings of exemplary control and skills, and displayed that he can play as a specialist batsman at No.4 and should have been tried at the position for the last three matches against Australia. But as alluded to in the article, the clarity of role definition has been missing from the team management. It is a pity really that for a side that has been so dominant in the past four years and boast of a W/L ratio of 2.074- the second-highest for any team since the 2015 World Cup, will go into the tournament with a soft underbelly and the team management's inability to strike a chord between experimentations and persistence plus the candidates inability to nail down the opportunity has contributed to it substantially.